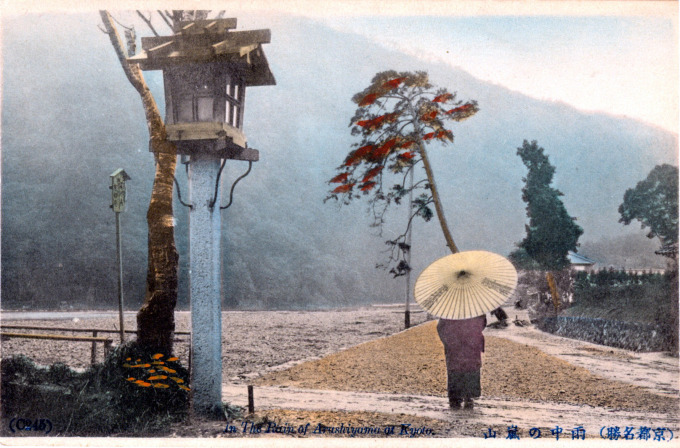 In the Rain of Arashiyama, Kyoto, c. 1910. The rainy scene in the postcard image is apropos: Japanese couples will travel to Arashiyama to break up. If you are thinking of visiting the region with your significant other, be sure to check the status of your relationship before venturing there. Arashiyama, Kyoto, c. 1908. 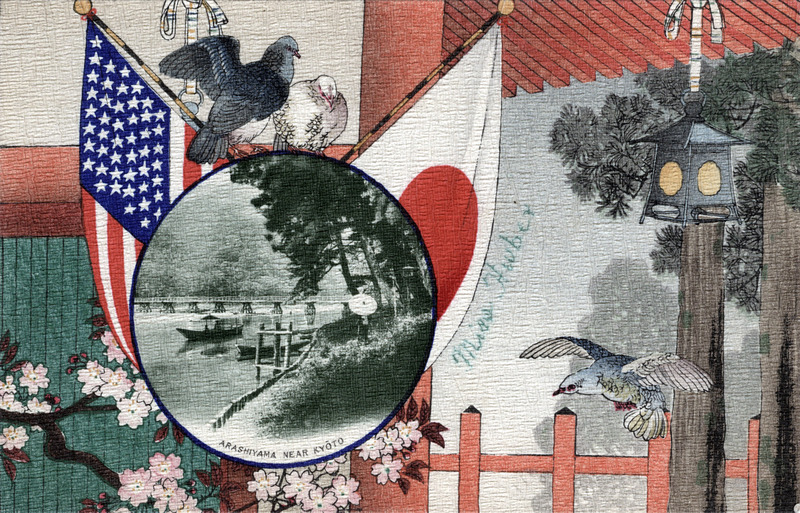 Souvenir postcard commemorating the visit of the Great White Fleet to Arashiyama in 1908. From the wiki: “Arashiyama is a district on the western outskirts of Kyoto, Japan. It also refers to the mountain across the Ōi River, which forms a backdrop to the district where the river emerges from a picturesque gorge. Sights include Togetsukyō [moon crossing bridge], notable for its views of cherry blossoms and autumn colors on the slopes of Arashiyama; the Iwatayama Monkey Park on the slopes of Arashiyama; the hamlet of Kiyotaki, a small scenic village at the base of Mt Atago, the home to a notable Shinto shrine; and Matsuo Shrine, half a mile south of the area, which is home to a blessed spring. It is also one of the oldest shrines in the Kyoto area, founded in 700. The alleged restorative properties of the spring bring many local sake and miso companies to the shrine for prayers that their product will be blessed. “The picturesque Hozugawa also flows through Arashiyama. During the Edo Period river traffic carried grains, firewood and other cargo, but trains and road haulage made river transport obsolete, and operations ceased after several hundred years of use. Today its boats are purely a tourist attraction: river rafting. 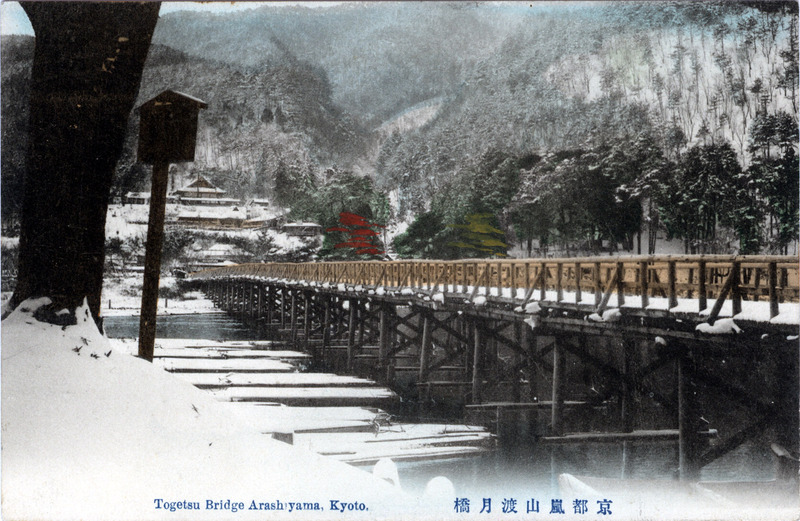 Togetsu (Moon viewing) Bridge in the snow, Arashiyama, Kyoto, c. 1910. “A faint scream of delight escaped from my mother’s lips. When I turned my eyes in the direction of my father’s finger I saw something that looked very much like a mountain slope wrapped in cotton-white clouds. A few minutes later we were hemmed in between the hillsides ablaze with the famous cherry flowers of Arashiyama. “We forgot the stream. What a wretched race of ingrates humanity is! Miles and miles through this enchanted aisle we must have glided. “At last — and so soon! tea houses, straggling strings of pebbly beach play ing at hide and seek with the cherry bushes, and the temple gables peeping out of the far woods, and the bridge laden with a thousand gay kimono which for all the world seemed to have stolen, out of the sketches of the Uki’yoe [floating world] School. 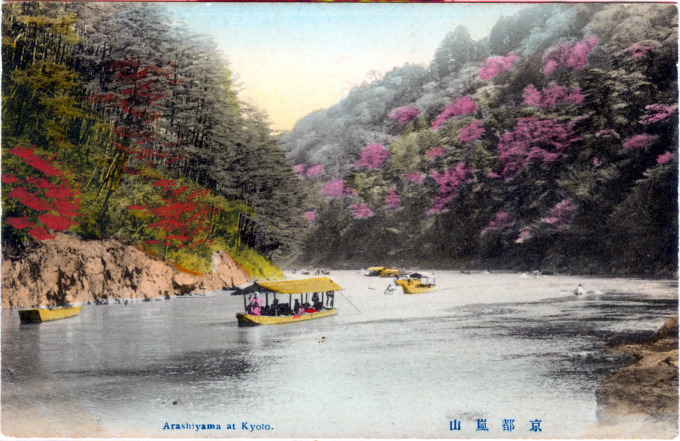 Cherry blossoms along the Arashiyama, below the Hozu rapids, at Kyoto, c. 1910.